Introductory Clients | Quest Capital & Risk Management, Inc. Helps to answer the following questions and helps to eradicate financial insecurity in retirement! Confused about how to create and maximize Income for Life? Anxious about how a stock market down-turn would affect your ability to maintain your standard of living? Concerned if you are doing the right things today with your money in order to best be prepared for the future? Unsure if you have saved enough to retire or what you can spend each month from your nest egg and not outlive your money? Retirement is essentially an income challenge: how do you take savings and convert it into a sustainable income for life? We work with clients to maximize all sources of retirement income and what we know is that where clients can move the needle the most regarding their income in retirement is creating a sound plan around converting savings to income. 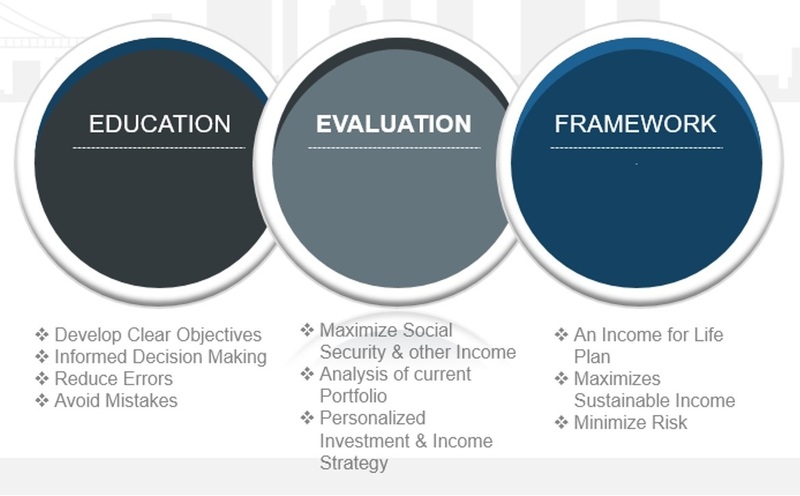 Our Income for Life Audit Package is the development of a plan that will help you think through how best to maximize sources of guaranteed income in retirement and how best to structure your investments in order to best produce a growing stream of income for the rest of your life and reach your unique retirement goals!